Hidden away in the Apennine Mountains and surrounded by Italy, San Marino is the smallest state in Europe. Also the oldest republic in the world, its origins date back to AD 301 when founded by a Christian stonemason fleeing religious persecution. 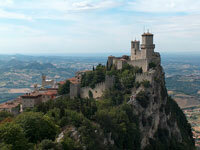 Perched on the slopes of Monte Titano, the City of San Marino is a UNESCO World Heritage Site. Walking through its alleyways and narrow streets will reward visitors with some unique discoveries and old-world architecture. Travellers can explore the medieval city's interesting past and culture in the historic centre, or visit the Three Towers of San Marino, situated on the three peaks of Monte Titano with views of the lush countryside. Other attractions include the Gothic Palazzo Pubblico and colourful fortress guards at Piazza della Libertà. Sacred art adorns the St Francis Museum while compelling stories wait at the Museum of Emigration. The Basilica di San Marino is awe-inspiring while nearby villages like Serraville and Valdragone make pleasant day trips. San Marino boasts a Mediterranean climate with mild winters and warm, sunny summers, providing the perfect environment to explore this truly magical country. San Marino is safe with very little crime, but visitors should be aware of petty theft and pickpockets. Although there are no major health risks associated with travelling to San Marino, visitors should have comprehensive medical insurance. San Marino has no airport of its own, but travellers can fly into Rimini, just six miles (10km) away. Sample some of the country's Limoncello and fine wine, or relax with a cup of coffee and a slice of La Torta Di Tre Monti (Cake of the Three Mountains) and watch the world go by in this beautiful, verdant mountain country.